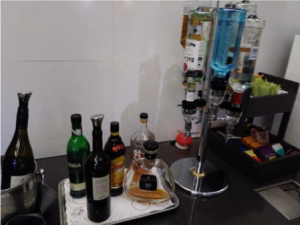 If you were ever wondering how to pass the time at Taiwan/Taiyuan (TPE) airport, we have a suggestion. 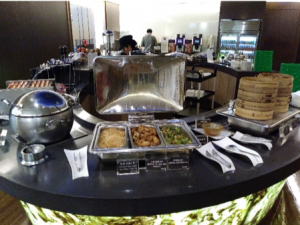 Depending upon the class of service and credit card tier and how you’ve booked your ticket on EVA Airways, their passenger lounges are absolutely the best bet. 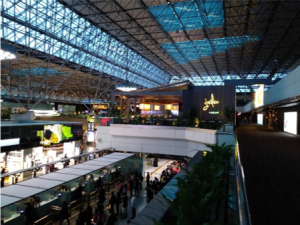 The airport terminal itself rivals any modern, upscale shopping mall, so there’s lots of shopping, eating, and browsing to be done. EVA hosts 4 passenger lounges, the Garden, Club, Star & Infinity and are on the second level. This trip, we visited the Star & Infinity where the staff is courteous and extremely helpful. The space also has other amenities besides the usual tables, chairs and refreshments. You can also shower or catch a quick nap in one of the flat-reclining chairs in a dark corner of the space. Did I mention refreshments? Yes I did. There is a large oval serving table in the middle of the food service area. Something for any taste East or West. A few soup selections, dumplings steamed or fried, congee, and noodles among the assortment. There is also a nice cooler full of crisp salads as well as another cooler filled with cold beer, juice, sodas, and waters. One of our personal favorites happens to be the over-sized hot dogs, fresh off the grill. They have regular and cheese-stuffed with amazing tasty fresh buns. This is the only place I’ve been able to find these hot dogs in Taiwan. I wonder where EVA buys them? Never seen them at a night market. 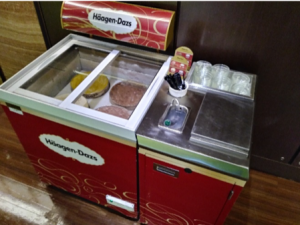 I think probably the best part of the EVA lounge selection before boarding a continent-spanning flight is either a do it yourself liquor bar and a serve yourself Haagen-Dazs ice cream freezer. Either one of which would provide ample motivation to miss your flight. In these days when passengers are alerted to report to the airport hours before flight time and are often stuck in extended connections, it’s very nice to know that EVA has thought ahead, and taken care of their customers on the ground in the same style and comfort as they do in the air. A quick call to the EVA toll free number can help you determine the qualifications required for entry into any of the EVA lounge areas.